Mullery auctioneers is currently offering for sale two very different homes at Dun Ard, Craughwell. This mature development is located off the N66 Galway/Loughrea road in Craughwell village and is within walking distance of the town centre and all the local amenities and facilities to include the local church, shops, and pubs, with schools also nearby. No 37 Dun Ard is a beautifully presented owner occupied four bedroom semidetached house. This residence has been meticulously cared for and is in walk-in decorative order. The thoughtfully designed and well proportioned accommodation includes an entrance hall, sitting room with fireplace, and double doors to the kitchen/dining room which overlooks the rear garden. The utility is situated off the kitchen. Also on the ground floor is a guest wc. There are four bedrooms, one en suite, and the main bathroom on the first floor. Viewing is highly recommended. No 7 Dun Ard is a spacious five bedroom detached residence with garage and is in first class order with a number of extras such as underfloor heating on the ground floor and a central vacuum system. The front and rear gardens are very well cared for with paved drive and lawn to the front and patio/lawn area to the rear. The accommodation includes a spacious entrance hall, large sitting room with fireplace and double doors to a well proportioned dining room. The kitchen is located to the rear overlooking the rear garden. The utility is situated off the kitchen, with the garage off the utility. Also on the ground floor is a downstairs bedroom/study and guest wc. There are a further four bedrooms, two en suite, and main bathroom on the first floor. The main bathroom and two en suites are fully tiled. This spacious family home must be viewed to be appreciated. 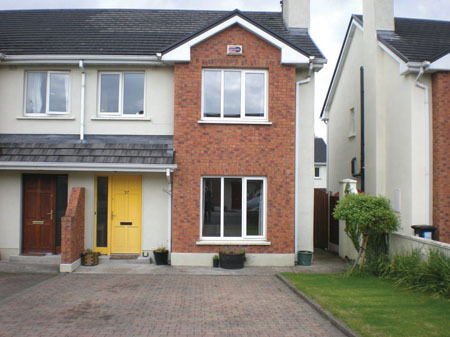 Full details of both properties are available from Philip Mullery of Mullery auctioneers, phone 091 567275/086 8101024.